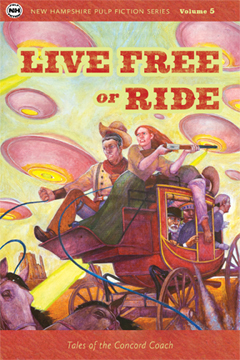 The Concord Coach rides again in a collection of short stories published by Plaidswede Publishing Co. of Concord, N.H.
“Live Free or Ride” is the fifth book in the publisher’s New Hampshire Pulp Fiction series. The stories feature the famed Concord Coach, which was built in Concord, N.H. The launch of “Live Free or Ride: Tales of the Concord Coach” will begin at 11 a.m. Saturday, Sept. 24, in the Transportation Museum of the Sandwich Historical Society in Quimby Park at 16 Maple Street in Center Sandwich. The museum houses the Sandwich Concord Coach that served guests at the Coe House in Center Harbor until 1914. Please bring lunch and a chair; dessert and beverage will be provided. The program begins with a history of the Sandwich Coach by the Sandwich Historical Society president Geoff Burrows, and an overview of the New Hampshire Pulp Fiction series by publisher George Geers. Editor Elaine Isaak will introduce six of the 23 writers in “Live Free or Ride” -- Kevin Barrett, Leah Brent, E. Christopher Clark, Margery Harrison, Jim Issak and S. J. Cahill.